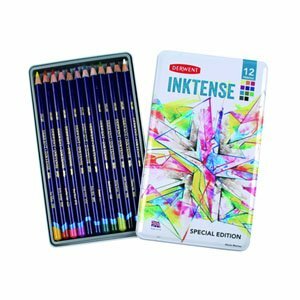 Derwent Inktense Special Edition Tin gives you 11 pencils usually only found in Derwent Intense 72 set and includes 1 new colour Turquoise pencil. With Derwent Inktense pencils you will have the intensity of both pen and ink in pencil form. Derwent Inktense Special Edition Tin pencils are permanent when dry and can be worked over to give ink-like effect when pigment is washed out.